IDPs arriving after fleeing the fighting. Now, the thousands of people remaining were compressed into a dense collection of trucks and tents. We could see bunkers under many of the trucks and what looked liked tunnel entrances. 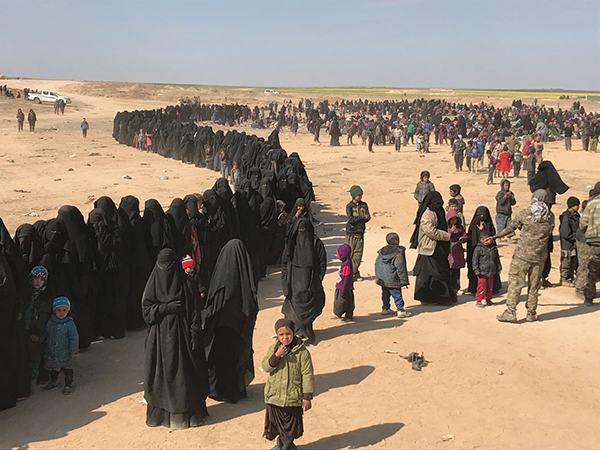 An ISIS woman from Norway who had fled earlier told us that there were over 30,000 people packed into this last small space and each person had only a three-by-six foot space to live in. “It is a horrible, dirty, starving, stinking place of constant maiming and death,” she said. In the middle of the tent-truck city were numerous buildings and these were the strong points that anchored the defense of Baghouz. Across the Euphrates to the west is Assad’s area and any ISIS who tried to escape across the river that way were killed. On the east side of the enclave is a wall of cliffs and bluffs that the SDF controlled and from which they poured fire down at ISIS; this was where we were. Under the cliffs hid more ISIS fighters, families and vehicles, right underneath us. Men sometimes came out to shoot at us, while others came out with no weapons to collect water from a ditch nearby. The ISIS truck and tent city near Baghouz. An SDF position overlooking Baghouz. 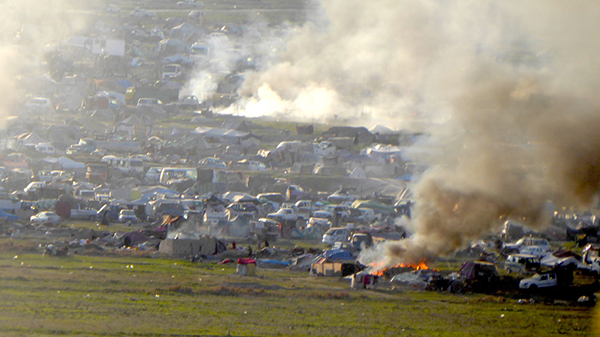 From the tent city, 800 meters from our position, came constant sniper fire and from the cliffs below us came intermittent fire from nearer ISIS fighters. 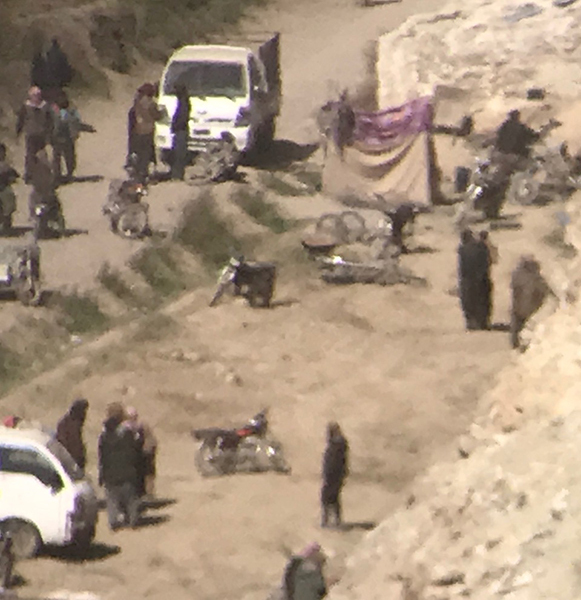 They also tried numerous times to infiltrate through gaps in the cliff bands, with some getting as near as 70 yards before the SDF stopped them. Sometimes ISIS machine-guns opened up from different locations in the valley and raked our position. As I looked at this scene, suddenly a wire-guided rocket rose out of the valley and flew at us, climbing and oscillating as it bore in on us. I could see the long, silver body and fins as it flew by me and turned my head to track it as it exploded into a position 20 yards to my right and behind me. Medics Eliya and Joseph and I began to treat the most badly wounded, including three men with head injuries and two with severed arteries. The medics managed to keep all of the casualties alive and the SDF evacuated them from the front line in their pickups. 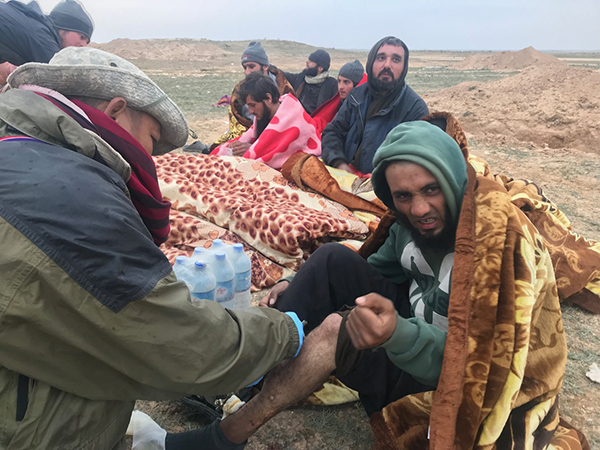 After they left, Zau came up and said, “Sir, my wound, it is a little bit spicy.” Joseph and Eliya treated Zau for his leg wound, which turned out to be minor, and our team rejoined the SDF at the front. Right away we came under accurate machine-gun fire to our front. At the same time, an ISIS element attacked us from less than 100 meters on our left flank. We returned fire and stopped the immediate attack. Over the next three days at this position, 14 SDF would be wounded and two killed. 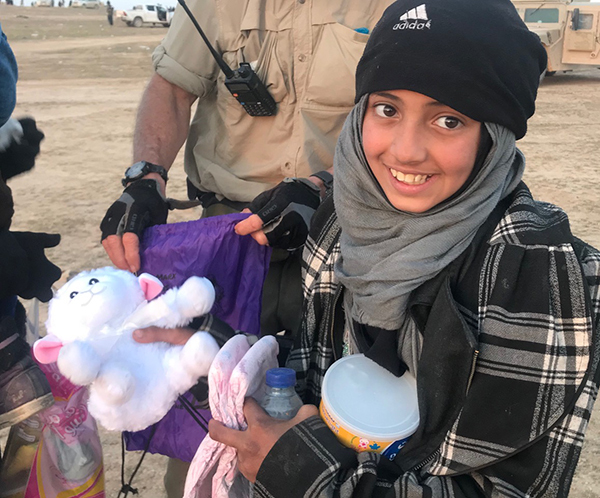 Our team treated all of these the best we could and we alternated between helping the SDF at this frontline position and caring for ISIS families as they escaped into the desert northeast and behind us – and this would prove to be where our main mission was. 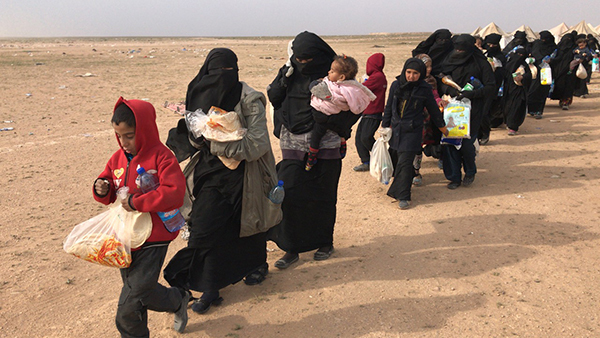 A line of ISIS families arriving after fleeing Baghouz. 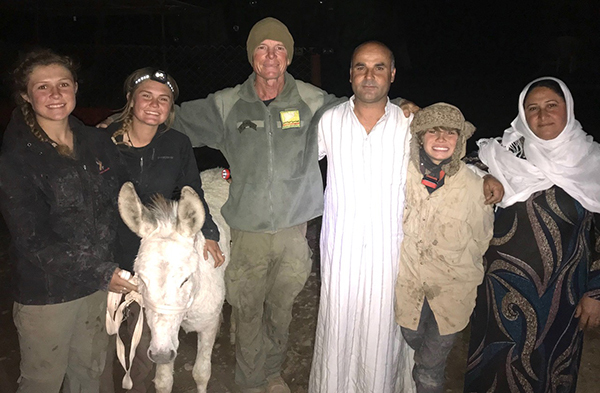 From February 1st to March 9th on this mission, we lived in the desert, with our tents and supplies clustered inside a dirt berm dug in a circle by an SDF backhoe. 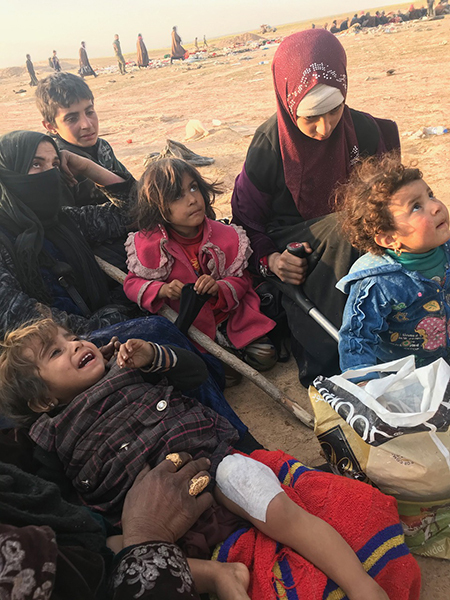 Several kilometers away from the city of Baghouz, we were close to the IDP collection sites, and as the SDF checked all those who had left the fighting, we provided material help and prayed with those we could. We also spent time on the front with the SDF, treating their wounded and helping them, but our main work was with the thousands of IDPs fleeing or being evacuated from the fighting. Our friends in Kurdistan had enabled us to come and help in this, our 8th mission to Syria since 2016. During this time, with the help of the SDF and all of you, we fed over 25,000 people and treated over 4,000 wounded, who came to these IDP collection points. We provided medical care, food, water, baby formula, diapers, blankets, and shelter. 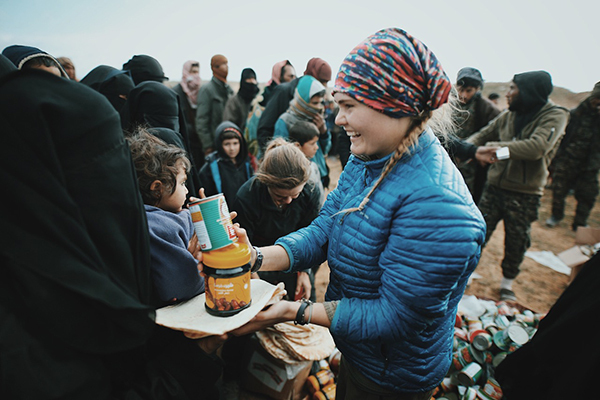 At the end of the mission, we left the SDF food and water enough for 7,000 more people that we estimated were still left in Baghouz. 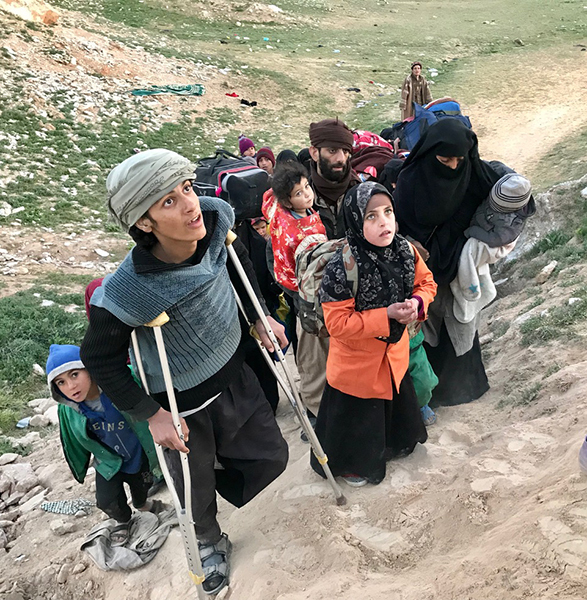 From the beginning of February to the middle of March over 30,000 people fled this last ISIS stronghold. We had been told on the first day we arrived, in February, that there were only 3,000 people left in the stronghold and that the battle would be over in three days. 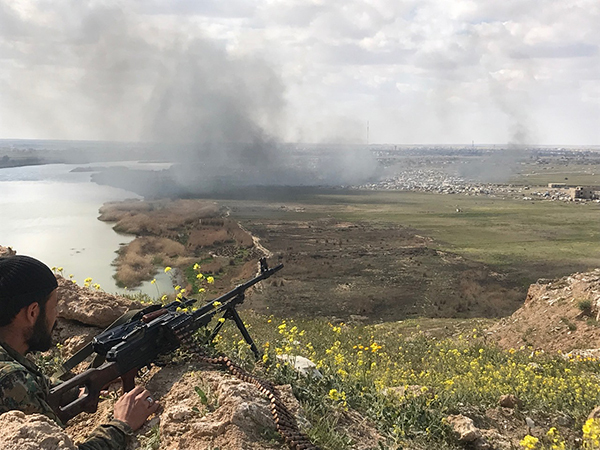 More than six weeks later, the battle for Baghouz has just ended, but ISIS lives on in scattered desert positions, in villages and in ambush sites in Syria and Iraq. There are still an estimated 20,000-30,000 ISIS members left in these two countries. ISIS lives in the minds of many who still feel that the ISIS creed is the ultimate way to serve God. The ISIS idea is based on a hate-filled and violent faith combined with a prejudice to anything that is not it. It gains strength from the real injustices people live under and takes advantage of this. It is brutal and aggressive, thriving in the harsh desert. Sahale gives food to an ISIS wife and child after they fled Baghouz. ISIS families after receiving supplies. Except for some Yezidi captives and other hostages who were now free, the people we helped were ISIS people and by now only the most hard-core were left, including many foreign families. An ISIS woman from Tunisia dressed entirely in black with eye slits in her burqa came to our food line, telling us boldly, “We are right, God is testing us. We will win.” When pushed on her ideas, she asserted ISIS’ right to enslave Yezidi women, saying, “They deserve it and our men can use them.” She also said she had watched the executions in Raqqa and thought they were right. More than one woman raised her fist to try strike my daughters as they handed out diapers and baby formula. “You are all dirty _____, _____, ____ infidels and may you rot in hell,” a woman screamed at us. Suicide vests were found on some of the women as they fled, as was a grenade that a man tried to hide as he came near. None of us were injured but many of the SDF have died when women and men exploded themselves in their midst. The press of angry people, the cry of children, the moaning of the wounded, the cold and calculating look of the ISIS men as they sat separated in rows on the ground, guarded by wary SDF troops, the constant threat of attack – all this made it easy for me to hate these people. Still many of the SDF troops showed mercy and care. “We have to live with these people when this is over. We want a new way for Syria,” they said. They surprised and inspired me, setting an example for all of us. We tried to give love to all the ISIS who came to us, but of the foreign women who could speak English, only one out of ten were remorseful and sorry they had joined ISIS. The overwhelming majority looked at us in contempt and hate. I thought about that question and the answer came to me: While we were still God’s enemies, God sent Jesus to carry our burdens. We have been given second chances. With His help can’t we do the same? And aren’t we called to do the same? I believe that in order to stop the evil actions of ISIS we must fight them. But in order to stop the idea of ISIS we must also respond in love. The evil of ISIS is not abstract for me: I was shot once and wounded three other times by ISIS in the battle of Mosul. 30 of my Iraq and Kurdish friends died around me. My close friend and interpreter, Shaheen, was shot and killed, suicide bombers tried to kill my wife, children and our teammates as they handed out food and water. I have seen many children killed by ISIS right in front of me. I have been attacked by and fought ISIS in trenches, tunnels and house-to-house. I have killed ISIS soldiers as they tried to kill us. I have felt the hate of, and also felt hate for, ISIS. But I have also felt the forgiveness of Jesus and the healing of my heart. I have learned that justice is only attainable by love and that revenge destroys us. We need to stand against ISIS and use force to defeat that evil – but that will not kill the idea. Only love will, and I believe only the supernatural power of Jesus can enable me to have that love. Each day at the Baghouz front I asked Jesus to forgive me when I began to lose my temper and hate the ISIS people. I asked for Jesus to give me love. Every day I felt a new love and patience that I knew were from God. The last day we were there, a group of ISIS men were captured and brought to the holding area. They looked angry, scared and dangerous. They watched us with calculating and hard eyes. An ISIS man receiving medical care from the team. Here I understood what this meant. Here was food and water, mercy and love to those who had make themselves our enemies. That love offered an opportunity for change. It is their choice. We left in peace and with love in our hearts. For us, because of God, love wins. 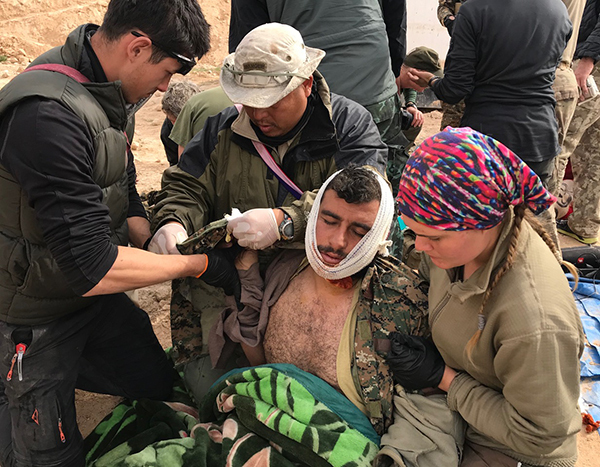 The team treats a wounded SDF soldier. A girl holds her new lamb toy from All Things Possible Ministries. 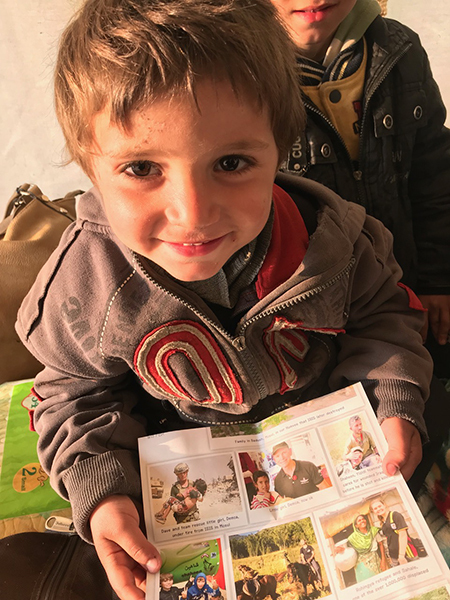 A father and daughter who escaped ISIS read new bibles given to them by the team. 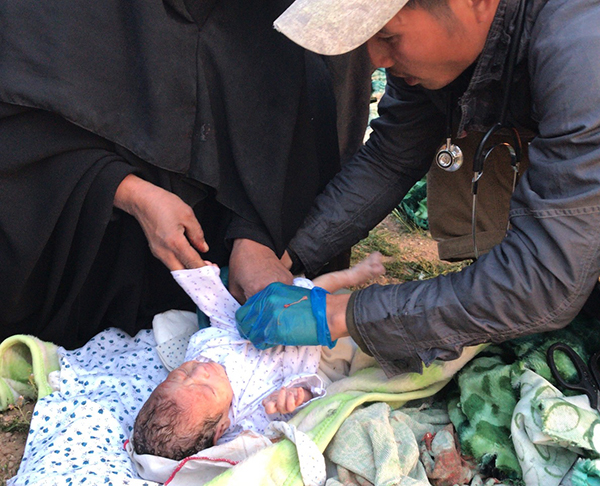 Joseph, a Karen medic, inspects a new baby born in the desert. 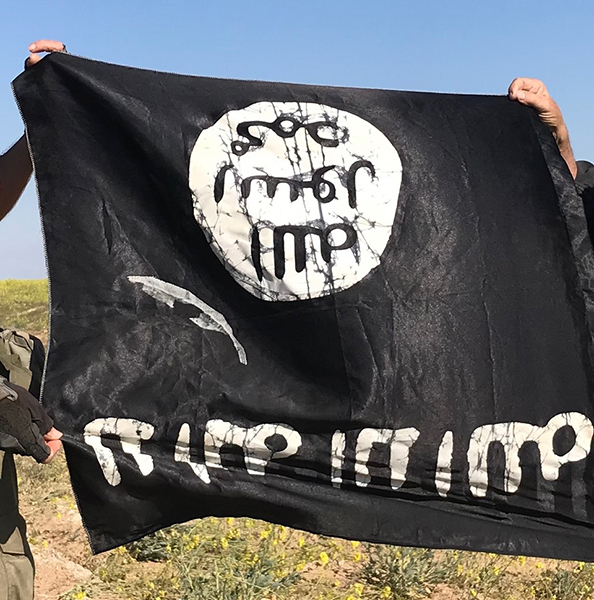 An upside down, captured ISIS flag. Snowflake, the orphaned donkey, with Sahale, Dave, Peter, and a new family.